This small drab warbler breeds across Alaska and Canada and is much more common in the West than in the East. It passes through Tennessee on its way to and from the wintering grounds in the southern United States and Central America. It can be found in the state from mid-April to early May and again in late September to early November. Description: This small drab-colored warbler is olive-green above, yellowish below with faint streaks, and has a yellow under-tail. The head has an inconspicuous orange crown, a broken eye-ring, a dark line through the eye, and a thin pointed bill. It lacks wing-bars and tail-spots. Females and juveniles look similar but are even duller. Western birds are yellower than eastern birds. Voice: The song is a fast unmusical trill, changing in pitch at end. 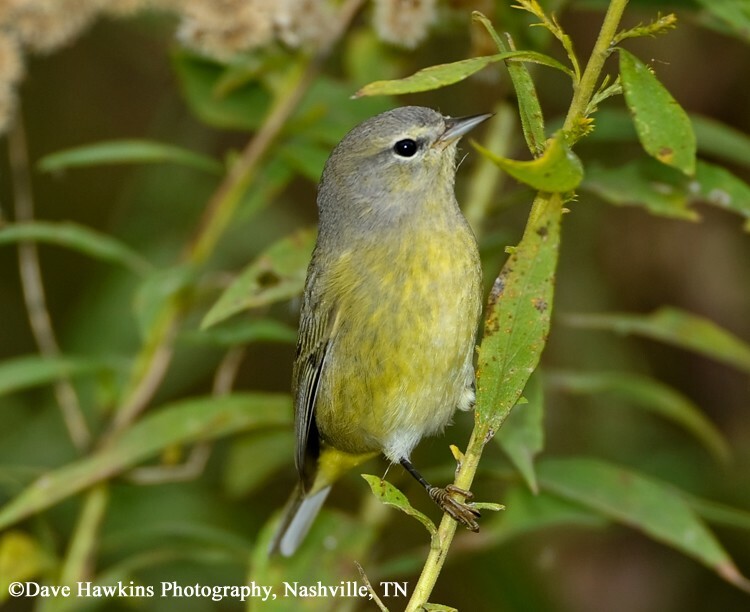 Tennessee Warbler can look very similar, but usually has a white under-tail, lacks the faint streaks on the sides of the breast, lacks the broken eye-ring, and shows brighter green on the back. Philadelphia Vireo is not as dull, has a thicker bill and a whitish stripe over the eye, lacks faint chest streaks, and moves more slowly. Nashville Warbler has brighter yellow under-parts and a white eye-ring. Yellow Warbler has plainer face with more prominent dark eyes, and has yellow tail spots. Habitat: During migration, found in woodland and woodland edges. 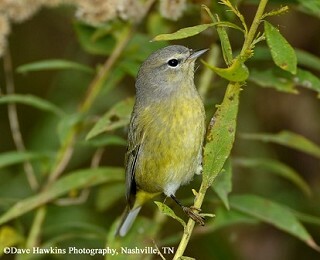 Nesting and reproduction: The Orange-crowned Warbler has not been documented nesting in Tennessee. Status in Tennessee: Uncommon migrant and rare winter visitor across the state. The genus name for the Orange-crowned Warbler was changed from Vermivora to Oreothlypis in the summer 2010 by the American Ornithologists' Union, the authority on bird taxonomy in North America. The Orange-crowned Warbler is divided into four subspecies across its breeding range that differ in plumage color, size, and molt patterns. The Orange-crowned Warblers breeding in the boreal forest of Canada have one of the latest fall migrations of any warbler, not leaving the breeding grounds until late September or October. Best places to see in Tennessee: In mixed-species foraging flocks in woodland habitats across the state during spring and fall migrations. Sogge, M. K., W. M. Gilbert, and C. v. Riper III. 1994. Orange-crowned Warbler (Vermivora celata). The Birds of North America, No. 101 (A. Poole and F. Gill, Eds.). Philadelphia: The Academy of Natural Sciences; Washington, D.C.: The American Ornithologists' Union.